A surveyor strives for both accuracy and precision. 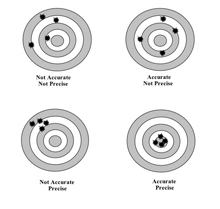 Many people use the terms “accuracy” and “precision” interchangeably. However, for those in the surveying profession (as well as other technical and scientific fields), these words have different meanings. To surveyors, “accuracy” refers to how closely a measurement or observation comes to measuring a "true value," since measurements and observations are always subject to error. “Precision” refers to how closely repeated measurements or observations come to duplicating measured or observed values. Using four cases of rifle shots fired at a bull’s eye target, each with different results, helps to distinguish the meaning of these two terms. These four sets of rifle shots illustrate the distinction that surveyors make between the terms “accuracy” and “precision,” as applied to surveying measurements and observations. Click image for larger view. Case 1: Not accurate, not precise: A shooter stands, aims through the rifle’s telescopic sight, and fires four shots at a target. Upon examining the target, the shooter sees that all four shots are high or left and scattered all around that part of the target. These shots were neither accurate (not close to the center) nor precise (not close to each other). Case 2: Precise, not accurate: The shooter assumes a prone position, rests the barrel of the rifle on a support, takes careful aim, holds his breath, and gently squeezes the trigger. The target shows that these four shots are very close together, but all four are high and to the left of the bull’s eye. These shots are precise (close together), but not accurate (not close to the center of the target). Case 3: Accurate, not precise: The shooter adjusts the rifle’s telescopic sight and, full of confidence that the problem of inaccuracy has been solved, stands and quickly fires four shots. Upon studying the target, the four holes are scattered across the target, but the location of each of the four is very close to the bull’s eye. These shots are accurate, but not precise. Case 4: Accurate, precise: The shooter again assumes a prone position, rests the barrel of the rifle on a support, takes careful aim, holds his breath, and gently squeezes the trigger four times. This time, the four holes are very close to the center of the target (accurate) and very close together (precise). To illustrate the distinction between terms using a surveying example, imagine surveyors very carefully measuring the distance between two survey points about 30 meters (approximately 100 feet) apart 10 times with a measuring tape. All 10 of the results agree with each other to within two millimeters (less than one-tenth of an inch). These would be very precise measurements. However, suppose the tape they used was too long by 10 millimeters. Then the measurements, even though very precise, would not be accurate. Other factors that could affect the accuracy or precision of tape measurements include: incorrect spacing of the marks on the tape, use of the tape at a temperature different from the temperature at which it was calibrated, and use of the tape without the correct tension to control the amount of sag in the tape.